Would you pay as much to see fake bands or tribute bands perform oldies songs as you would to watch original members from the '50s to '70s? Probably not, but many people are duped into doing so! John Steele and Larry Marshak manage some of those knockoffs. In this flyer, for instance, one of these acts is not like the others. Which one? Read on. Fake: Jr. Walker's "All Stars" of Motor City Memories. With Steele's clout they got a gig with real Motowners on the summer tour promoted by the image above. Don't be tricked! Real: Jr Walkers Allstar Band (note the difference, without some punctuation) with Motown-era pedigree in Victor Thomas and Tony Washington. They're losing opportunities to Steele's group. Fake: The Sounds of the Supremes, whose members never signed with Motown. Real: The Former Ladies of the Supremes, two (originally all three) of whose members did. Fake: Marshak's suspiciously youthful Marvelettes. Real: The late Gladys Horton and Her Marvelettes. Fake: The Mary Jane Girls with Val Young. Real: JoJo the Original Lead Singer of the Mary Jane Girls, aka Joanne McDuffie. The phony-bands practice extends beyond Motown. Over the years, Marshak has unleashed multiple versions of "the" Drifters, Coasters, and Platters on tour. Meanwhile, there's an important distinction to make. Tribute bands cover old favorites but don't claim to have direct ties to Hitsville. That's fine. That's honest. So are impersonators--they do their work with a wink and the audience is in on the fun. Fake bands, however, advertise themselves as featuring original members without really having any. In effect, they're committing fraud. Sure, the hirees can sing, dance, and wear their costumes with gusto. Fans get their oldies kicks. Clubs get their profits. Promoters, managers, and agents get their fees. Everyone's happy. Everyone except the actual Motown artists and fans getting ripped off. This is a serious problem. More bookings for fake bands and more people ignoring the dishonesty mean fewer opportunities for the originals to make decent wages in their twilight years. These are not millionaires bemoaning how they can't become billionaires. Many Motown singers were gifted teens and 20somethings who earned little initial pay. Many naïvely signed away the rights to their group names--and future residuals. Now, many music trends later, the salad-days money and public interest have petered out. It's once again a struggle for these artists to keep doing what they love. Today's pretenders wouldn't be getting their gigs if it weren't for their predecessors. What a way to thank them! Fortunately, people have taken notice. This webpage, for instance, is about the true-blue Coasters and fake singing groups in general. Even legislators are taking a stand against deceptive advertising through the Truth in Music Bill, whose proponents include Mary Wilson (despite her own backing by the fake Jr. Walker band Summer 2009). May riled fans know who to really see and exploited artists win back their identities. If you want more info, Robert Fontenot's article summarizes the overall problem and the legal remedies well. Any journalists or authors out there willing to document the who, what, where, and when of bogus oldies bands? If so, feel free to contact me. I can provide an additional resource. It's easy to sigh on hindsight at the tragedy of legitimate, once-adored stars ending their days broke and ignored. Let's pay our own tributes to them now by not supporting the impostors. 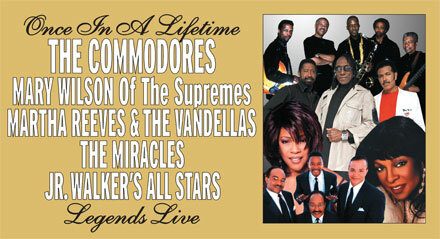 To book the Legendary Classic Motown Show featuring the real Jr Walkers Allstar Band and the Ladeez (who have worked with the Former Ladies of the Supremes, Martha and the Vandellas, David Ruffin, the Miracles, and others), please call 231-629-1298. For its European tour, contact Tsahara Productions. Learn more on my site about the stars of the recent Legendary Classic Motor Town Revue Tour: Jean Terrell, the Contours with Sylvester Potts, Brenda Holloway, and the first incarnation of Jr Walkers Allstar Band. Had enough of fake bands? Ain't nothing like the real things on the homepage.